"November 17th, solo campaign, all eras in multiplayer & many more!" As if yesterday's teaser for Episode VIII: The Last Jedi was enough, another big trailer hit today that has Star Wars fans very excited. Despite the leaks from earlier this week, Star Wars Battlefront II is gonna be a big sequel for EA and DICE. The game will be out on November 17th for Playstation 4, Xbox One and PC with a lot of content. Just like The Last Jedi's teaser, the trailer below gives you chills as Star Wars always does. https://www.youtube.com/watch?v=Kae-JjbLsgA The multiplayer will be seeing gameplay improvements, but more importantly all three movie eras will be represented in Battlefront II. Just from the trailer, Darth Maul and Yoda are confirmed playable along with Rey and Kylo Ren from the new era. Splitscreen co-op is also confirmed to return, but nothing official if it's gonna be something new. The developers also announced that no season pass will be available to purchase due to the feedback how that went with the original. They didn't want to stagnate the fanbase again because of the DLC packs they released. The big addition I'm looking forward to most is the new single player campaign that EA says it will be canon to the movies. 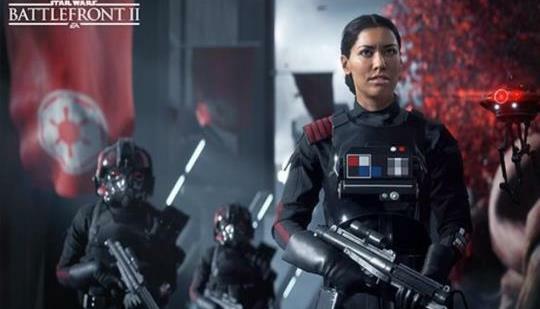 Taking place after the events of Episode VI, you'll play as Iden Versio, commander of the Inferno squad, on her journey to what transpires in the new episodes. Luke and Kylo Ren are also set to have roles in the campaign as well. The pre-order incentives are also big for Star Wars Battlefront II. If you do reserve the game, you'll get The Last Jedi content for Rey and Kylo Ren. The Elite Trooper Deluxe Edition is also tempting to get because you get to play three days early and a variety of ability modifiers that will be useful for gameplay in it's first days. More information is trickling out from Star Wars Celebration, so we'll keep you updated on anything more big besides what we know so far. Star Wars Battlefront II comes out on November 17th for Playstation 4, Xbox One and PC.